Hope all of you had a wonderful holiday weekend! Ours was truly one of the best of the year! We enjoyed a lot of warm weather, sunshine, delicious food, family, time to relax & of course, special time as a family of 3. On Thursday afternoon we took a nice long walk with Olivia to where Dustin proposed three years ago. The sunshine was out & her bonnet was on. Basically, a perfect combination. After our walk we had a mini date night...our favorite BBQ & time together just the two of us. It was the perfect way to kick off the long weekend ahead! Dustin of course had work off on Friday the 4th [three cheers!] so we spent the day at my parent's pool. 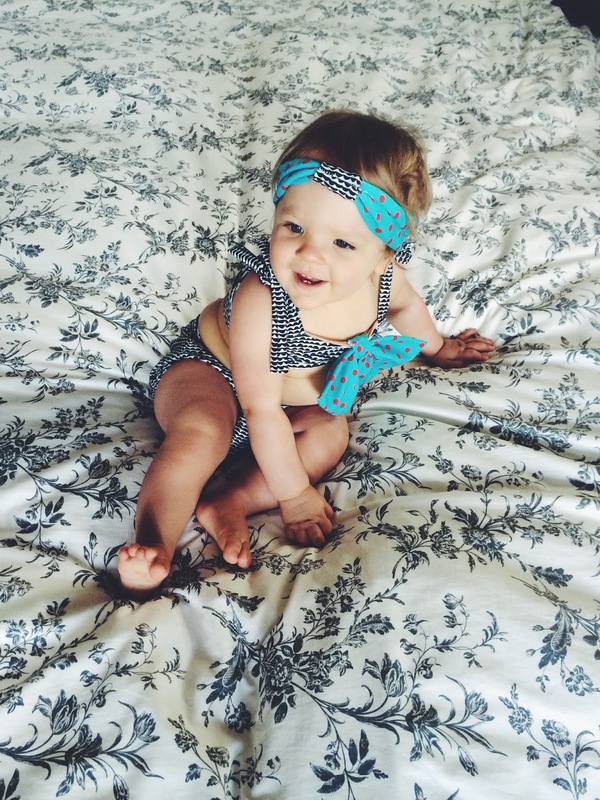 Olivia rocked her new bikini but was more interested in sitting on a towel poolside eating snacks than actually getting in the water. 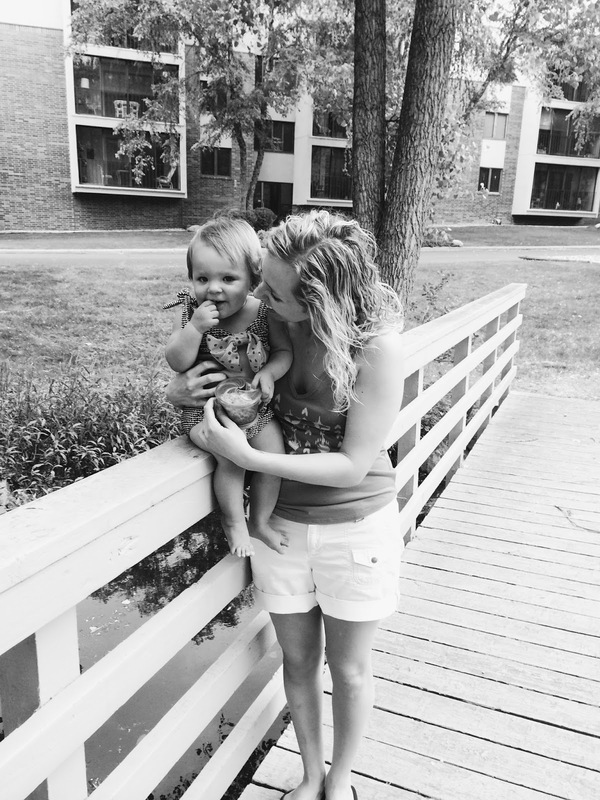 We enjoyed frozen lemon bars at the pool and then walked around to feed some baby ducklings at a nearby pond, which Olivia of course loved. After a few hours at the pool, it was nap time for V. We headed home and relaxed while Olivia napped for 4 hours straight [a new record]. It was glorious. About two hours into her nap, my family came over for a big cookout. We grilled salmon, asparagus, chicken brats & of course enjoyed some juicy watermelon. No 4th of July is complete without it! Being that it was the 4th, a bonfire was nonnegotiable. Sitting outside in our backyard having a fire and making s'mores has become our go-to summer activity in the evenings. Dustin got creative and invented the "s'more tower," as he calls it. 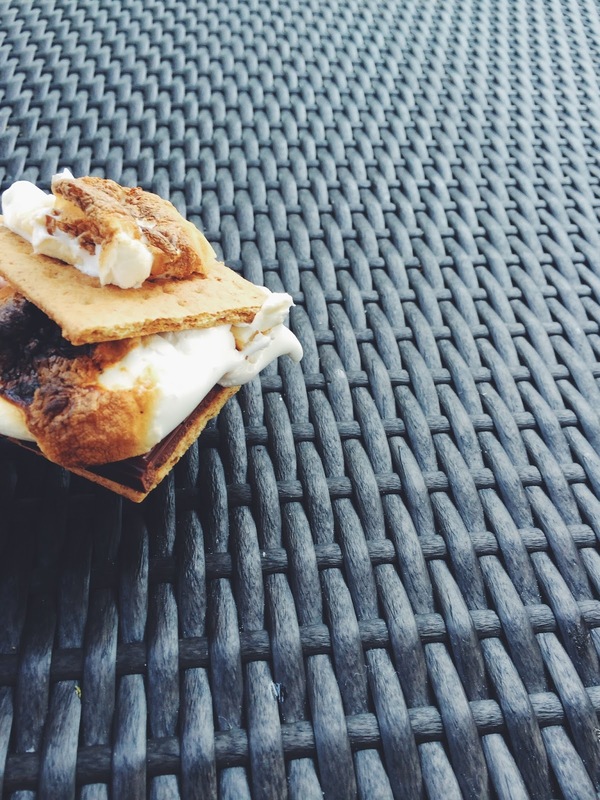 Roast 3 marshmallows, put two in between the grahams with the chocolate and then top the s'more with the third. Ahhh-mazing. Toasty marshmallow in every bite. On Saturday, we slept in [the other nonnegotiable weekend] and then headed to my Mom's for a big brunch -- complete with chocolate chip & blueberry pancakes with fresh whipped cream, parmesan potatoes & bacon. Divine. We planned to head to the lake afterward but since the weather was perfect and we were already there, we spent the day at the pool again. I enjoyed a solid 30 minutes of uninterrupted floating in the pool. I didn't think I could be that relaxed ever again. And now it goes without saying that "pool floating" is on the agenda for every single week left of summer. 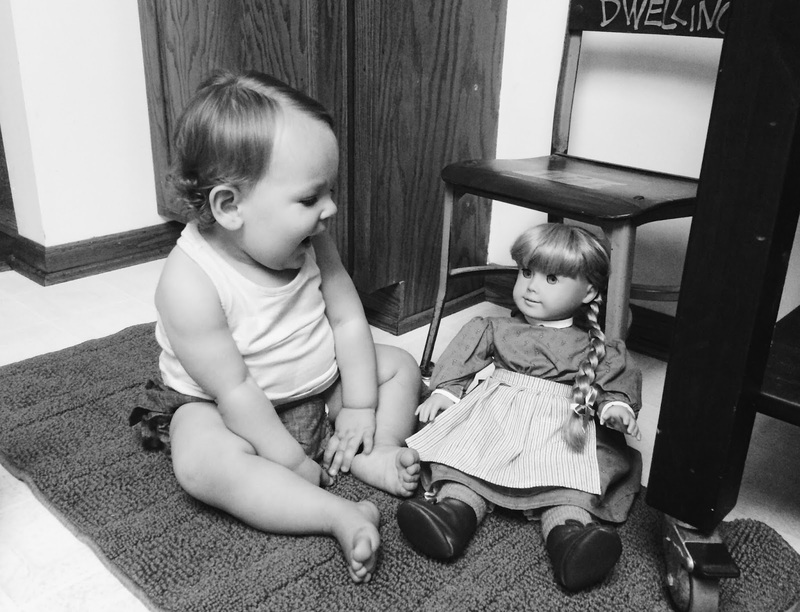 At Grandma's house, while we made brunch, Olivia had a blast playing with my American Doll from childhood. She sits on a chair in the kitchen and as soon as we arrive, Olivia always go straight for her. It's so much fun for me to watch Olivia play with the same toys and dolls I played with as a little girl. We spent Saturday afternoon rearranging our guest bedroom [so much fun!] and then Saturday night was another dinner from the grill, and it may have been the best meal we've had all year. It was that good. 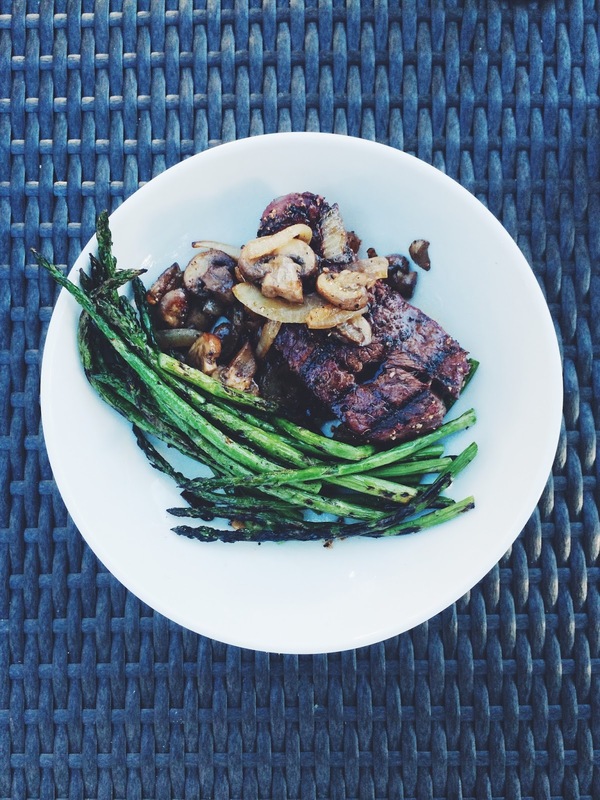 Steak, asparagus & sautéed mushrooms & onions. There is something so good about simple, whole food that is packed with protein and delicious flavor. As we were sitting outside on Saturday night, I noticed [surprisingly, for the first time] that we have the perfect pair of trees in our backyard that were just begging for a hammock. So on Sunday after church, we stopped by REI and chose the ENO Double Nest in Black/Khaki. Dustin is an REI member so we got it at a great price and it is the most amazing thing ever. Sunday afternoon and evening is mostly a blur, because I spent the better half of the day reading and napping in the hammock while Dustin tended to Olivia. We enjoyed chipotle on the patio, my parents stopped by for a fire & I ended up in bed at 10:30pm which never, ever happens. 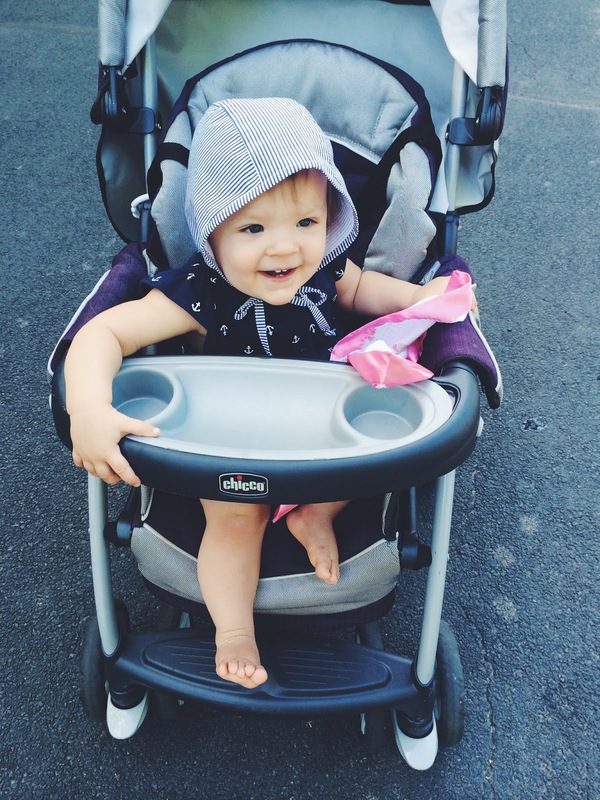 Olivia is napping & I'm blogging from the 'mock, swaying in the breeze. I told Dustin I don't think I'll ever get out. But I suppose I'll have to, because making dark chocolate muffins & going to the park is on this afternoon's agenda. Happy Monday! Looks like such a fun weekend! I'm totally jealous of your perfect hammock trees! I have an ENORMOUS backyard and ZERO trees for a hammock! Your baby girl is adorable!! Her swimsuit is divine! SO adorable!